Package contains: One base stand with sizing adapter sleeve (for use with 1” to 1.25” diameter poles), one, three-tiered telescoping aluminum pole (1” diameter), one eagle ornament, two plastic rings with grommet screws. Fillable base has snap closure – stays on tight (not for filling with liquids). Note: Base holds maximum of 8 pounds of sand. Easy to set-up… Slide one of the clear rings with grommet screw up to the top of the pole – top of the pole is the thinner portion. Remove plastic screw from the clear ring and line up the top flag grommet with the hole on the clear ring – screw in screw. Do the same with the bottom screw and bottom flag grommet. Adjust the alignment of the screws so the flag is straight and adjust the distance of the rings so the flag is pulled tight. 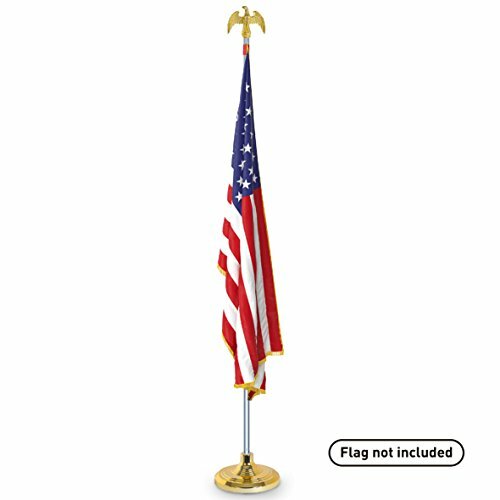 STRONG AND DURABLE - Brushed aluminum telescopic pole allows for the option of setting your flagpole at 6 feet, 7 feet or 8 feet. VERSATILE - Two ring grommet screws allow for adjustment to hold a 2X3 Foot or 3X5 Foot flag (Flag is not included with this kit). DECORATIVE AND HIGH-QUALITY - Gold base and matching gold eagle decoration. EASY SET-UP - Base can be weighted with up to 8 pounds of sand or other solid filler (no liquids). 100% SATISFACTION GUARANTEED - We are so confident that you will like our Indoor Flag Pole Kit that if you return it within 30 days, we will give you a full refund on the product price. Try it, we know you will like it! If you have any questions about this product by EasyGoProducts, contact us by completing and submitting the form below. If you are looking for a specif part number, please include it with your message. Pro Pad Gadsden "Don't Tread on Me" Sleeved Motorcycle Flag 10"x15"